The Farm Market News offers auctioneers and their clients multiple avenues to promote auction sales. 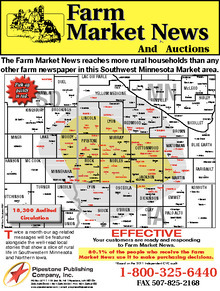 The twice-monthly Farm Market News is widely read and distributed to over 18,000 rural homes. 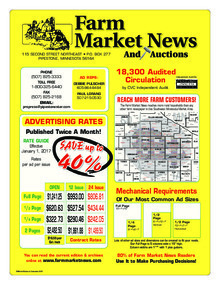 The print edition features a robust auction calendar and auction sale bill advertising. We also publish the weekly Free Star, County Star, and SW MN Peach. If your sale requires additional print advertising, we are here to help. Our knowledge of the region's publications allows us to work with auctioneers and recommend publications that will best fit their marketing goals. We handle the design, placement, deadlines, and systems so you don't have to. Our customers can work with just one rep, approve just one ad, and pay just one bill. All of our auction calendar listings are promoted at www.farmmarketauctions.com free of charge. The web site offers search and sort capabilities to help you find the sale you are looking for. We also offer complete sale bills online for any auction sale ad that runs in any publication we represent. The complete print edition of the Farm Market News is offered for online access free of charge. This can be seen by following this link to our digital editions. This digitized format allows for interactive links to web sites and email addresses. To learn more about these services complete the form below or contact our sales department at 507-825-3440 or 1-800-325-6440. Why advertise in the Farm Market News? - Many businesses advertise in every Farm Market News publication. They continue to advertise because it works. - 80.1%* of the people who receive the Farm Market News make purchasing decisions based on the ads. - The Farm Market News goes to over 18,000 rural households. This represents a huge market for your products or services. - Over 1,000 copies of the Farm Market News are picked up each month at various coffee shop distribution points. - Additional circulation is gained online with a complete digital version. - The Farm Market News goes to every rural household within our market area.You don't get only part of the market, you get all of the market. - No other ag publication covers the rural households in our market area like the Farm Market News does. - Our news stories are focused on people from many different areas of our market. This means that the people who receive the Farm Market News probably know or will be familiar with the subjects of some of the stories. - Local stories = High readership, which means your ad will be seen. - 83.9%* of the people who receive the Farm Market News regularly read each edition. - The classified section is read by readers looking for equipment listings, vehicle listings, help wanted ads and other for sale ads. - The Farm Market News cost per household is very inexpensive. Affordable rates backed by solid distribution and readership get results. When using the powerful combination of the Farm Market News and Southwestern Peach, your ad will get in front of over 42,000 Farm and Ranching households. The Southwestern Peach, with a circulation of 24,000 subscribers is a supplement to 16 newspapers, all in ag based communities. These are the papers that everybody in the area read and rely on for community events, local news, school activities and sports. The link below will open a PDF File of our coverage map. Download "Farm Market News Coverage.pdf"
Click the link below to download a PDF file with information about our rates, available contract discounts, and publication dates. Download "FMN Ad Rates & Calendar 2017.pdf"